Johannes Andersen for Uldum Møbelfabrik, 'Juliane' set of 8 dining chairs, teak and fabric, Denmark, 1960s. 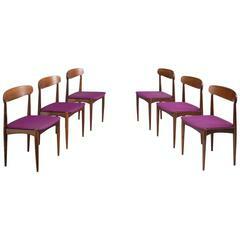 This set of 8 dining chairs is designed by Danish Johannes Andersen and produced by Uldum Møbelfrabrik in Denmark. The set is executed in teak and upholstered in woven beige with hints of grey and yellow upholstery. The legs are tapered. The back is carved and has a beautiful, organic sculpted form that branches out from the middle in a thicker slat that is attached to the seat.